I was greeted by well over a foot of fresh new snow when I got up this morning. Far more than the changing of dates on the calendar, this made it clear that outdoor projects are now officially on hold until spring. It actually brought a small sense of relief that the “to-do” list has been decimated by the constraints of Mother Nature for the foreseeable future. Sitting and looking at the snow, I was left to ponder the projects of last summer and fall as well as to consider what new projects I plan to undertake come spring. 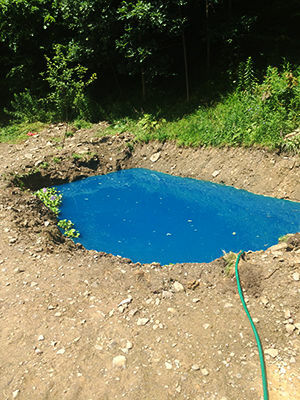 One of the most interesting projects of this last year was the pond that I dug in preparation for a large deck project I intend to do this coming year. It comes to mind first because staring out the window at the frozen snow covered surface reminds me I need to check the thickness of the ice to see if it is safe for skating yet. I had never even thought of skating when we put in the pond but winter weather has made that an obvious bonus. It was in digging the pond I made my first real attempt at using heavy machinery and excavators for a home project. 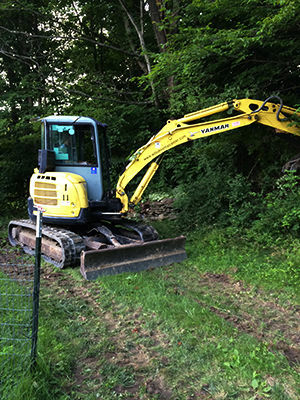 While virtually anybody can go and rent a fairly large excavator from the DIY tool rental center near here, renting it and using it safely and efficiently two very different things. I have rented floor sanders and ceiling sprayers in years past, even a jack hammer to remove an old concrete walkway, but a 6 ton excavator was a whole new level. While many tool rental centers allow you to rent virtually anything you want, I had done some research prior to that particular weekend rental. Between lots of research on technique both online and by way of discussing the task with some acquaintances that do that type of work professionally I was able to accomplish my goal. This was helped along by years ago practice of running heavy equipment on a large dairy farm in my youth so I was not complete unfamiliar with the operation of hydraulic buckets and tracked vehicles. It was in this research that I came across plans for some of my spare time this winter. While many projects are on hold by the weather, I can actually use the winter months to prepare for them. The number of training classes, both online and in the local area to learn new tools and safe construction techniques is astounding. Even in a relatively rural area such as where I live there are classes available from the local adult education center, the local tool rental center, and of course online classes. While already competent in many areas of home carpentry and construction, I would be foolish to believe I know all there is to know about it. Taking advantage of some of these classes and opportunities to learn new techniques is going to be my New Year’s resolution. The cost of classes will be more than recovered in savings in time, materials, and ability to do things for myself that I would otherwise have had to hire outside help on, but really the personal satisfaction is the big payback. Learning safe and effective operation of new tools and equipment is my winter project, so next year I can consider taking on some even more interesting and challenging projects. Well, summer is almost here and my biggest home project is to renovate my porch and make it a lovely place for cocktails in the evening.